In this file photo dated Friday, July 29, 2016, a man crosses the iconic rails leading to the former Nazi death camp of Auschwitz-Birkenau in Poland. 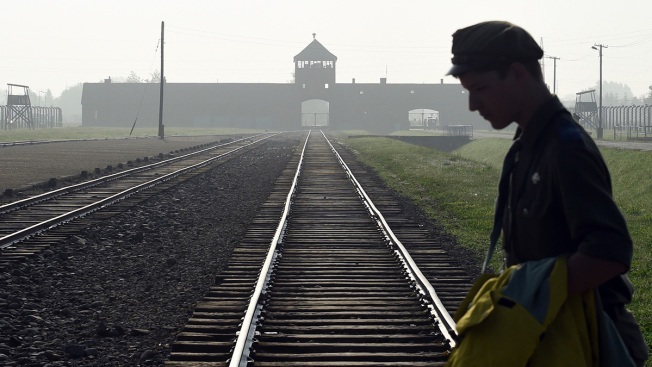 Police official Malgorzata Jurecka in Poland said Sunday, March 31, 2019, an American visitor to the former Auschwitz-Birkenau death camp attempted to steal a metal part of the rail tracks where prisoners were unloaded, and he has been charged with attempted theft. An American visitor to the former Auschwitz-Birkenau death camp attempted to steal a metal part of the historic rail tracks where prisoners were unloaded, officials said Sunday. The 37-year-old man has been charged with attempted theft of an item of cultural importance, according to Malgorzata Jurecka, a police spokeswoman in the southern Polish town of Oswiecim, which was under German occupation during World War II. The crime can be punished with up to 10 years in prison. Jurecka said the man admitted his guilt but has been released as he awaits further steps. Pawel Sawicki, a spokesman for the Auschwitz-Birkenau state museum, said the memorial museum's security team became aware that the man was trying to remove the metal element on the historic rail tracks and then alerted police. The memorial site has faced multiple attempts of theft and vandalism in recent years. The most dramatic case was the 2009 theft of the sign with the Nazi slogan "Arbeit Macht Frei" ("Work Will Set You Free") at the death camp's main gate. It was found cut into pieces and was eventually repaired and stored in a safe place. A replica is now in its place. Some 1.1 million people were killed during World War II at Auschwitz-Birkenau, the most notorious of Nazi Germany's death camps. Most of the victims were Jews but many Poles, Roma, Soviet POWs and others were also killed there.